Authored by bschiffner on Jun 11 2017, 2:16 PM. It supersedes https://phabricator.kde.org/D1350 which was accepted but didn't make it into plasma-workspace. diff 2 structures the original patch from Kai Uwe by a clear arrangement of date/time/datetime and size. It separates data shown from data to be copied. This prevents automagically added access codes to be copied. This enables comments in the entries not to be copied too. 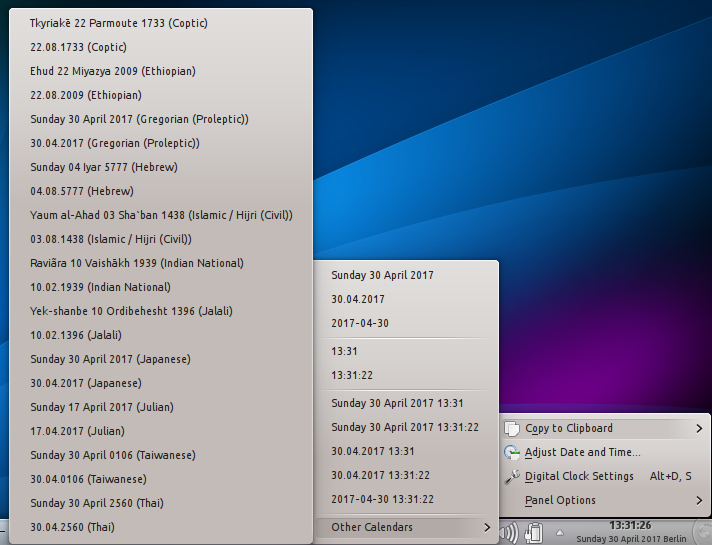 The patch adds a submenu intended for other calendars as they get doable with a more advanced QLocale. As a POC it shows now UNIX Time and Julian Date. I have some minor nitpicks below, otherwise looking very good. You don't need to mention "Fixes https://bugs.kde.org/show_bug.cgi?id=355190" in the commit message, the "BUG: 355190" already does this, also causes Bugzilla to auto-close the bug once committed, etc. The reason I did not finish/submit my original patch is that the time dataengine is updated only once every minute (unless you have seconds enabled) so when you open the menu the seconds will not be accurate but reflect the last time it was updated (usually being 0). I will try to figure out a way to force an update explicitly from QML, so we can finally have this in. Prefer QString() over an empty literal ""
You don't need to create this menu here, QMenu::addMenu(QString) that you're using below already creates a new menu for you (basically just remove this and the next line). It's a bit of a shame that we're mixing two data sources in the same applet, but I guess we're limited by whatever works. you're removing everything that isn't ':' or a number ? Why? Does every locale use : as a separator? lets not put POC in code that we want to merge. Also, by your own comment later, this leaks. We want "menu" not "this" as the second context. If you delete the menu first, this crashes. Neither should happen, but better to be safer. It was integrated to my best understanding and works for me. Why "^[0-9:]"? Sometimes it is just fun using the biggest sledgehammer. But in all respect: it is even gender neutral to be smashed this way! The QML / once a minute update problem (seconds all time 0) I didn't notice until now (4 PC/Notebook). So, the question is what to do regarding the seconds :/ I couldn't figure out a way to cause a refresh of the data source. (A hack could be to disconnect and connect sources before showing the menu but urgh). This way we always only update when the respective context menu is opened. Sorry for not understanding the (perhaps your?) problem with the seconds. On all PCs (x86/AMD64) I use the patch on i get the time of opening the context menu with a "correct" value of seconds. This value can be copied from the clipboard anywhere. And you are right: there is no urgent need for a display of seconds and if not displayed it would remove some "visual bloat". If you do not have seconds enabled in digital clock, the data source is only updated once every minute. You might not see this if you try it right after startup but eventually the seconds will always be :00 making it pointless to copy seconds. Ideally, we find a way to update the data source in the instance the menu is opened but I didn't find one. Ah, I got it now and will try it. But if the user decides not to see seconds displayed, it can be interpreted plausibly he doesn't want to see them in the clipboard too. Good idea! Why didn't I think of this. I think this is a perfectly valid assumption. Can you take a look at this (and possibly my other comment)? Otherwise I can also take on and finish your patch from here, we had you waiting long enough :/ and would really nice to finally have this in the next release. I think you get it much faster done. Please do it. It supressed the seconds to be copied into the clipboard in case of the per minute update of the display. Missing: I don't know how to make the result of the action available to the MMB (middle mouse button). Kai Uwe, David any ideas how to proceed with the change last week? I read this (unfortunately unpleasant) bug report the other day and was just asking on IRC how to put data the clipboard. I'll be studying this closely - nice work! I don't know how to make the result of the action available to the MMB (middle mouse button). QClipboard::setText() has a mode argument that specifies which buffer it should use. Thanks Kai-Uwe for your advices with the qml problems. I'am far from understanding this topic. Mostly cargo cult, but nevertheless working. Do you have commit access? else I need your email address and can push it on your behalf. @Kai-Uwe: Can you do the merge (DigitalClock.qml#77) before pushing, please?